The imaginary fiction in the scientific movies is now real stuff to talk on. Artificial intelligence and machine learning are taking technology to the next level of advancement. Many giant companies endeavoring to leverage this technology to understand the customer's demands and engage for better success. Even the social marketing giant Twitter has joined the league. Further, in the recent announcement, the company declares that they are going to use insightful machine learning technology to recommend tweets to its users. A few years back, Bebo, MySpace and then Facebook created huge hype in the social media world, people were excited about sharing photos, finding events, and chat. But when we take brand communication, it requires calling, email sending, company online presence, for seeking information either to display information. For instance: 95% of millennials expect to be able to engage with brands via Facebook and 42% of brand marketers state that Facebook is critical to their day-to-day business. And Of course, companies are exploring innovative technology in order to manage the huge conversation in an efficient manner ( As per stats, on daily basis 1.5 million pieces of user-generated content on Facebook is left behind by the users). If we look back, social media was more of a regular photo posting, ads display, liking comments, responding to question and similar activities. But, with the popularity of smartphone technology and wireless internet advancement, the rise of social media platforms cannot be overlooked. This is the reason, many brands gradually started to manage social media marketing campaigns employing the ideal strategy for social media app development. Over the past few years, social media development company has come up with an essential customer-service and sales channel, upsurging advancement in Social media and chat applications to a greater extent. Predominantly used by younger demographics, now, the social media is used by people of all ages. (Most of the users are active on two to five different social media accounts regularly). As we know, one of the most important new tech trends in social media development is machine learning and artificial intelligence. 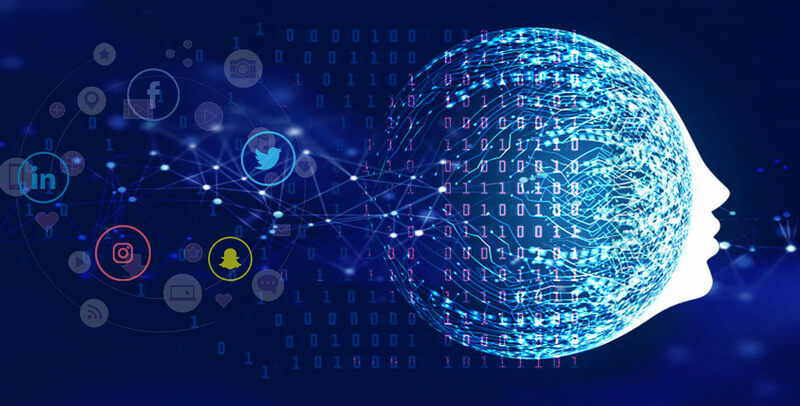 Further, Industry leaders like Facebook’s Mark Zuckerberg and Chris Messina foretell that the technology like machine learning and AI contribute an effective means of engaging millions of social media users. Further, it will transform sales and customer service in the years to come. Research also reveals that brands having a quick response to feedback in a thorough manner establishes consumers loyalty. And with, Bots or machine learning systems it's easy to learn to respond client's regular/frequents questions. Here, the business can take advantage by blending big data analysis and machine learning. The brands can target users with messaging in a language they really understand and at the same time push offers, and ads that excite them. Functionalities that Machine learning technology comprises for developing a custom digital assistant. Here are some of the major advantages of Machine Learning in Social Media revolution. According to source, 82% of the Twitter users watch video content and 90% watch it on a handheld screen. For instance; Twitter has announced to purchase magic Pony Technology that enhances the visual experience of the users. And using this technology, twitter automatically sharpen the video and images. As we know how crucial is Videos and live streaming for the next generation of social media, the Twitter strategy will be an advantage. With the advancement of technology, Facebook uses a deep neural network in order to determine the which adverts are ideal for which users. The company can detect the spam content and the users using the advanced AI/ML mechanism in the social media app. It also recommends the potential content and predicts the likely whether the hit, can monetize ad performance. Today, big conglomerates are vulnerable to data spam. Due to this Pinterest has started using Machine Learning Technology take benefits. With it, the company can find out the spam content and the users, recommend the content and predict the likelihood that a person will pin the content, can monetize ad performance. Google+ treasures 2.2 billion users, out of which 111 million are active users. This makes reaching out users a priority concern. Analysing this, Google has recently adopted machine learning that automatically attaches tags without further data input. This was done with the aim to abstract concepts and attach metadata without the further mouse click. To win the highly pertaining competition, empower your Social Media App Development with an efficient personalization engine, advanced search mechanisms, and secure authentication. Want to stand out from your competitors, give your business a boost with a unique Social Media App powered by machine learning. Feel in the form to connect us! NEXT POST Drupal Commerce: How It Can Benefit Online Store?